There really are many times in life when we experience problems that seem to be so difficult that we think there’s nothing else we can do but give up. Yet there are people who continue to inspire us for their drive to continue on living and making the most out of their life, despite the difficult situations they are in. 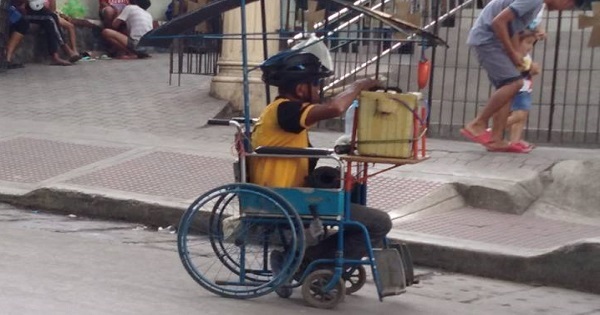 Take for example this admirable vendor who converted his wheelchair so he could still earn money despite his condition. He was spotted by a netizen who shared his picture on Facebook – and he became an inspiration to many netizens who greatly admired him for not giving up and just staying at home or even begging money from others. Sherrylee Molina-Baliano shared that she found the wheelchair-bound vendor in front of the Church in Tungko in San Jose del Monte City, Bulacan. The guy has complete limbs but Sherrylee noticed that he was having a difficult time moving, leading her to guess that he probably suffered from a stroke that’s why he is now using a wheelchair. Yet despite the situation he was in and the difficulty he was experiencing in moving as he was going up the sloping street, Sherrylee said the vendor refused to give up. Instead, he angled his wheelchair in such a way that he could push it up with his healthy leg. The going was difficult yet the disabled vendor continued to slowly push his wheelchair up the street, earning Sherrylee’s admiration. “Sa mga nawawalan ng pag asa dahil sa kalagayan nila sana tularan nyo si manong, habang may buhay may pag-asa, pag gusto may paraan. Hanga po ako sa inyo, sa kabila ng inyong kalagayan nakukuha nyo pa rin mag hanap buhay,” she wrote on Facebook. Some netizens said that they recognized the guy and that he hails all the way from Bagong Silang, Caloocan while others said he also goes to Pleasant Hill, San Jose Del Monte, Bulacan. Wow. 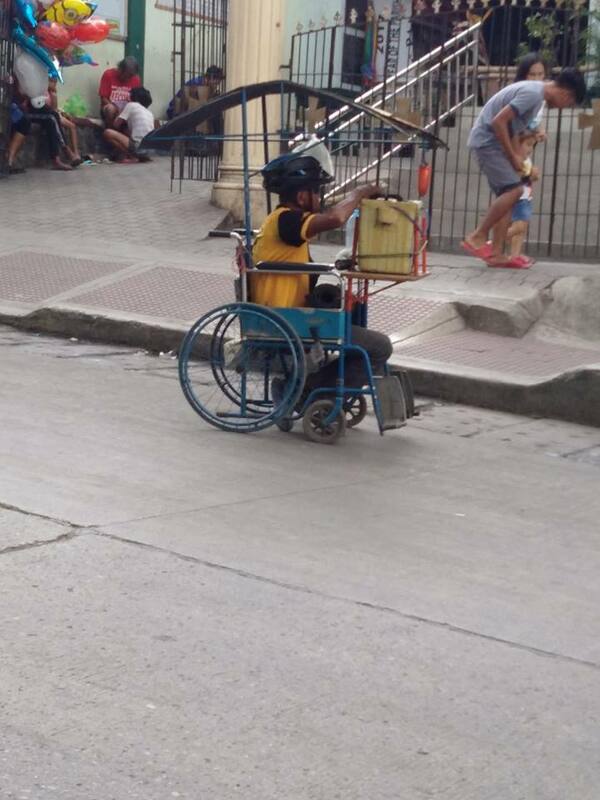 After learning that this hardworking disabled vendor reaches far areas, many netizens hoped that someone would donate a motorized wheelchair he could use or perhaps a modified motorcycle-cart he could use.